Alcohol is a very valuable commodity that has many uses now and will be invaluable during a long-term disaster. When used responsibly and safely, it can give you a powerful edge with everything from powering engines, to making medicines and even starting a fire. ReadyNutrition Readers, this article is not to expound on alcohol’s qualities as a beverage, but on the different type of alcohol and the uses it has. This valuable commodity has several uses from a survival perspective that are worth examining. In this piece, we will be examining the three most common types available to you. Let’s jump right into it and give you something you can use! Vodka (usually 40%), Brandy (usually 40%), Scotch (40-60%), Grain alcohol (85-95%), Gin (37-60%). Methanol is also known as wood alcohol (CH3OH). As the name implies, it is taken from wood, and its main use is in industry, and in high-performance engines such as racecars and “monster” trucks, as well as other specialty engines. Methanol does not give a flame off when burning and can be put out with water. Isopropyl alcohol (also called “rubbing” alcohol) sees a use in several different household needs from cleaning to disinfecting. Isopropyl (C3H8O) alcohol is widely available in all your grocery and big-box stores and varies in concentration from about 50% all the way up to 99% (usually found in feed stores or hardware stores in that concentration). You can pick up a bottle of ethanol and keep it in the vehicle without having it freeze, especially grain alcohol, the preferred ethanol to be used in tinctures. It can be seen, then, why in my previous articles I mentioned the advantages to making naturopathic aids and herbal solutions in tincture form for several reasons. Firstly, it is not difficult for even the novice who is interested in herbs. Secondly, the tincture lasts at least three years, if you were to assign an “expiration” date on it. Lastly, if you make a tincture that is, say, 60% alcohol? 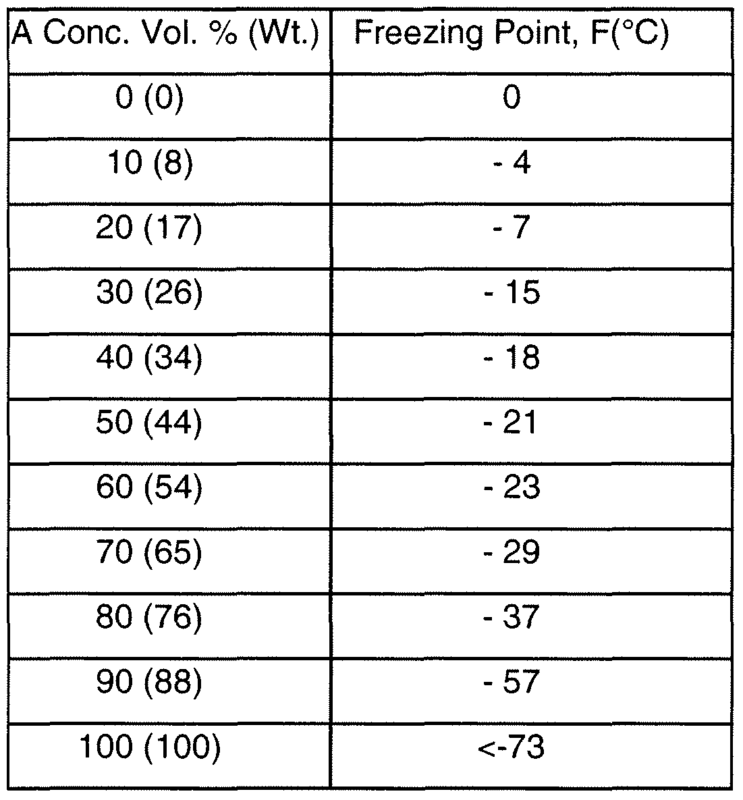 As you can see by the chart, it will not freeze until it reaches -23 degrees Fahrenheit. That’s pretty cold! An electromagnetic pulse may take out the grid and all your heat, but your herbal tinctures will be safe for a time. There are other uses for the alcohol, as well. Rubbing alcohol is important for first aid, and can be used as a fire-starting fluid. Do any of you live in a cold area during the winter? Well, have you ever had your windshield-wiper fluid line freeze up? Chances are most of you drive models of vehicles that keep the line heated. If not: you can rely on alcohol! Pour yourself a small spray bottle worth of rubbing alcohol (the ones at Wal-Mart you can pick up for a couple of bucks and it’s 90% concentration). Pour your alcohol into the spray bottle, and when you must clean off the windshield, it won’t freeze and can take off that grease and grime. A “squeegee” helps, along with some rags you’ll have to get rid of or wash periodically. You can use it on the headlights and taillights as well during these months when your vehicle becomes covered with road salt and filth from the macadam. Great for cleaning up those wiper blades, as well. The alcohols can be used for barter goods, as well, and as mentioned have many uses for disinfectants and wound-cleaners. Ethanol is not the preferred method for this next tip, but it can work when you have nothing else: an anesthetic. You may just have a patient who is not compromised from a respiratory perspective (say a gunshot wound to the leg or arm), and a few drinks may be just what is needed to remove that bullet or those shotgun pellets. Use your best judgment and think outside of the box without going overboard. In summary, alcohol is a very valuable commodity that has many uses now and will be invaluable after the “S” hits the fan. When used responsibly and safely, it can give you a powerful edge with everything from making medicines to starting a fire. Use your imagination, and it will serve you well. Looking forward to some comments, tips, and suggestions from all of you Readers out there. Please share your experiences and insights, and stay in that good fight! JJ out! Could This Be the Perfect Generator for Preppers? Thanks for this article, JJ. From what I’ve read, vodka is the best form of alcohol for medicinal uses, although I don’t remember why. What a great informative article! I do have to point out however that when the SHTF, most people will seek out alcohol not for its many post-SHTF uses, but rather as a way to cope with the fact that the SHTF in the first place. Sad, but true. There are many types of alcohol and many uses of diff alcohol types, so, wouldn’t it make more sense to learn how to distill alcohol in the first place, along with stocking up on it too? When that supply of Jose Cuervo runs out, then what?